Those who attend will be able to take in an exhibit outlining photos and descriptions of the behind-the-scenes process, and hear more about the project from those involved. 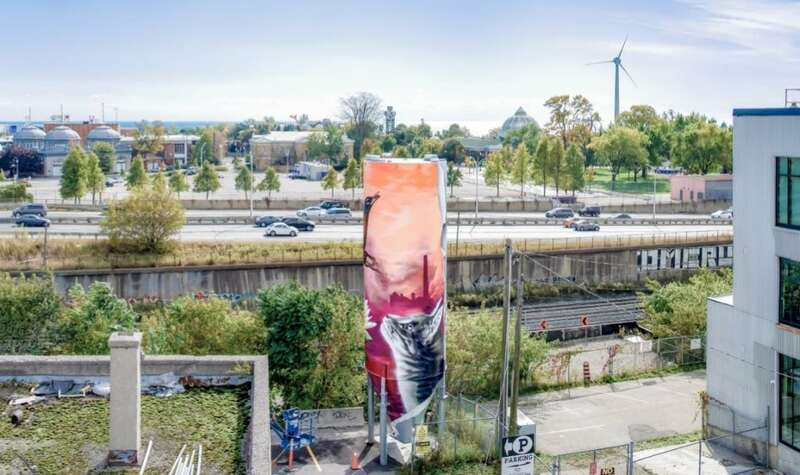 The South Liberty Trail Silos Mural Project was a public art initiative that repurposed four silos and two hoppers along the South Liberty Trail in Liberty Village, from Dufferin Street to the Exhibition GO station at the south end of Atlantic Ave. Throughout the month of October, four professional mural artists brought bold, colourful and inspiring designs rooted in the local characters, stories and history onto the silos that line the public trail and are visible from the Gardiner Expressway. The project, managed by Mural Routes, is part of the City of Toronto’s StreetARToronto Partnership Program, and was made possible with initiative and support from York Heritage Properties and Adgar Canada. The project was developed with the encouragement and support of StreetARToronto after the property owners, local developers York Heritage Properties, connected with the City to discover ways to support improvements to streetscape and walkways of South Liberty Village. The silos were left behind in the Canada Bread facility at 2 Fraser Ave., a property that has now been transformed into office space by York Heritage and Adgar. The idea came from Rolf Seifert, lead architect on the project, who envisioned saving the silos in order to line the South Liberty Trail with the industrial artifacts as public art. Robert Eisenberg and the York Heritage Properties and Adgar team enthusiastically jumped on board. The project has been the first of its kind in Toronto to use silos as canvases for large scale mural art. Murals on industrial sized silos provided a new and exciting challenge. The silos provided a unique opportunity for the artists to paint on a new type of outdoor surface, and so the project call attracted some of the top mural artists. The participating artists were: Alexander Bacon, birdO, Emmanuel Jarus and Troy Lovegates. The artists were chosen from an open call and whose design have been fine-tuned in consultation with representatives from local BIA, Mural Routes, architects and Whitman Emorson, a local creative consultancy. Those who caught a glimpse of the artists at work throughout October were encouraged to share photos, and could follow along on social media using the hashtag #SLTMurals. Mural Routes is the only member-based not-for-profit arts service organization in Canada dedicated to the creation, development and promotion of public wall art. Their vision is to inspire the creation of extraordinary public wall art that serves as a catalyst for community building. StreetARToronto (StART) is an initiative of the Transportation Services Division. StART is an innovative, public-private partnership designed to develop, support, promote and increase awareness of street art and its ability to beautify the city’s visual landscape and decrease graffiti vandalism. York Heritage Properties acquires, renovates, retrofits and manages architecturally interesting older buildings in Toronto to provide a dignified, sophisticated alternative to costly, conventional office space. Led by Michael Cruickshank, Vicki Rodgers and Robert Eisenberg, York Heritage Properties is very much a reflection of its principals’ long-time enthusiasm for, and commitment to, the preservation of Toronto’s rich architectural heritage. Michael and Robert have founded two Business Improvement Areas: the St. Lawrence BIA and the Liberty Village BIA. Adgar Canada, led by CEO, Chris Tambakis specializes in the long-term ownership of well-located, high quality office properties. They own a portfolio of well-located, high-quality office properties in the GTA. Adgar’s ownership and management philosophy is hands on, thoughtful with a strategic long-term investment approach. Adgar is fortunate to have a shared vision and successful partnership with York Heritage who exemplify a commitment to restoring and retrofitting designated historical structures within Liberty Village while respecting the history of the area. The South Liberty Trail is an extraordinary complement of their combined philosophy and strategy.